Filing income tax return online, the employee tax return is always being a difficult task every year, You have to run behind the tax consultant and your employer for preparing complete documents and filing your return. After going through this article “, you will not only fill your return but also become friendly with Income Tax Departement, this article also guides you “how to fill IT return”. Before filling your income tax return form you must prepare your checklist of documents required before commencement of E return. Documents required for filling E return. Before selecting the assessment year it is very much clear to understand the difference between assessment year and financial year. We all have heard the term financial year and we all know that the financial year starts from 1st April and ends on 31st March. If we talk about the financial year 2018-2019, We are talking about the 1st of April 2018 to 31st of March 2019. As far as Assessment year is a concern, the department is allowed to assess the books of the account after the years ends, that means if the financial year is 2018-2019, so the assessment year is 2019-2020. Selection of ITR Form is one of the most important steps, most of the Employee select the wrong form which income tax return form and fill their ITR Return and they have to face the consequences in the form of notice from Income Tax Departement. For the employee salaried income + Income from Other Sources + income from house must select itr i. Income Tax department provides for the type of modes for submission of ITR form as per the convenience of the employee. One is online mode and other is the offline mode. 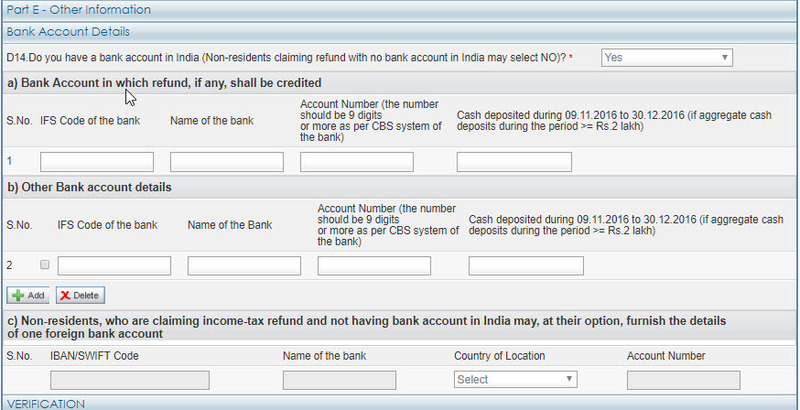 You also have to select the option for submission of your return for verification. After Going inside you have to fill 6 steps detailed form which includes personal information, although the system will fetch automatically same information from your PAN card information and rest need to be filled by ourselves for filing income tax return form for an individual for the assessment year 2018-19. Income details, tax details, tax paid and verification and 80 G Details must be filled properly and you must aware of the tax return instructions. Some other information like a selection of employer categories like government, public sector and other is mandatory and selection return categoria is very important. It reveals the income tax department that you are filling the return for the first time before or after the due date, which is very important. Sometimes due to some correction after submission of E Return, we also revised the return by selecting received return 139(5). Also Read: What is Form 15G Form 15H? 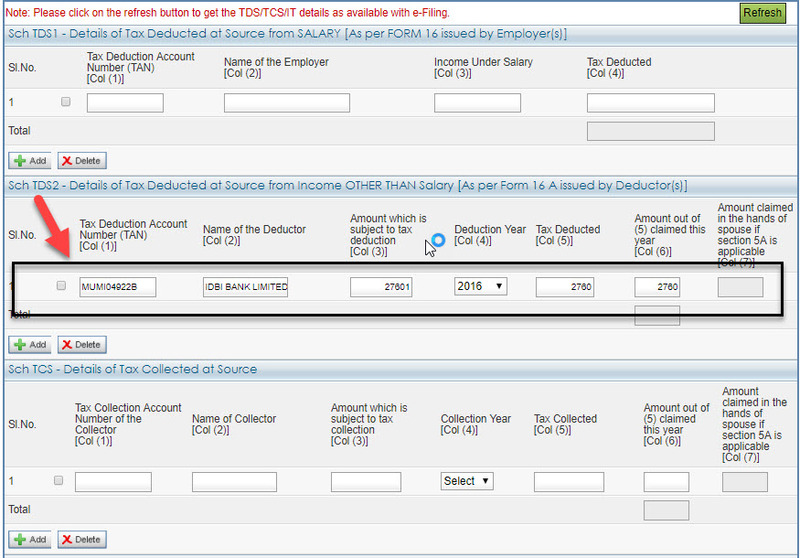 If we revised notice from the Income Tax Department under section 142(1), 148, 153A, 153C, 139(9), you must select the option in “Return Filled”. If you are revising your return and resubmitting under some sections, it is mandatory to fill the column of original acknowledgment number, date of filing of an original return, notice number. That action will fetch your previous return to the revised return. 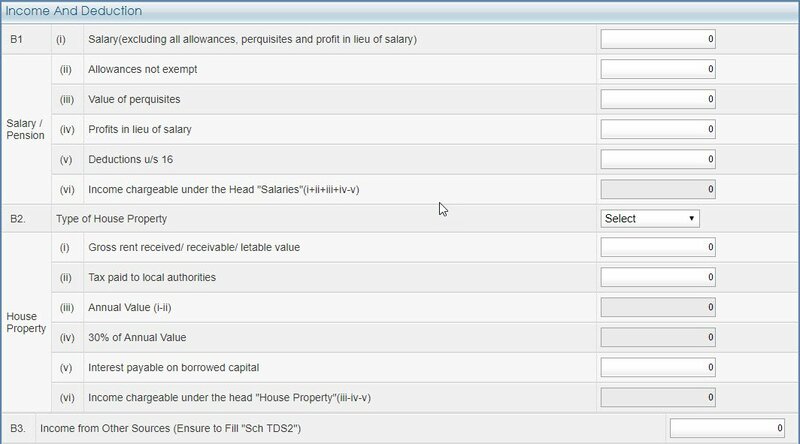 The second section consists of income details in which you are honestly required to fill the income details from salary/pension, before entering the amount, it is recommended to deduct all income tax exemption options for an employee. It is not mandatory to enter the take-home amount in the column. B1, B2 & B3 are three categories: Income from Salary, income from house property like rent etc also need to be filled, income from other sources like from equity, mutual funds, other income from services etc need to be filled in the column B3 while filling online income tax return. You will get gross total income after adding all three. Section 80, plays a very important role for the taxpayer, not only for the employee but also for other tax payee segments. 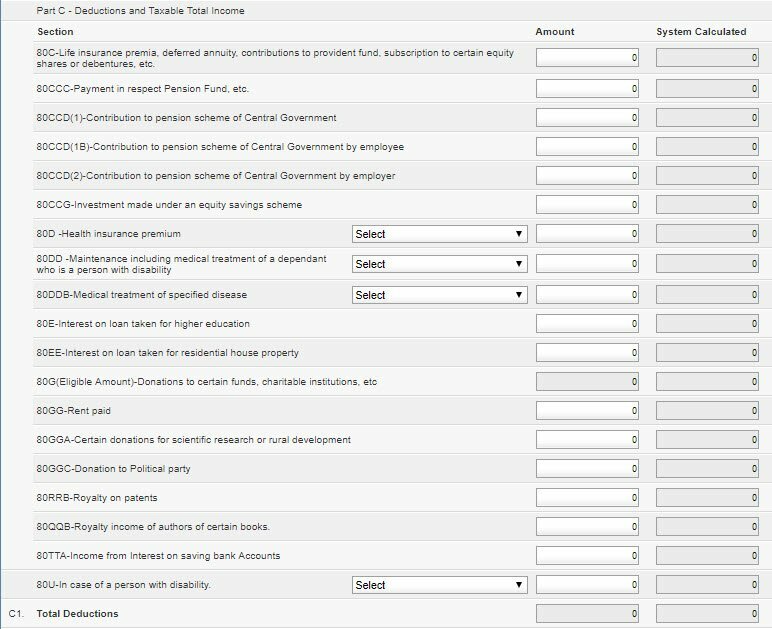 80 consist of different subsection under which you can reduce your Gross income and the amount up to a certain limit will be deducted from your income. The income tax department as per certain level declared by the Govt of India, sum up all your deduction amount and provides you the “Taxable Total Income”. This section calculates the amount of tax applicable and also compensate your Tax amount u/s 87A up to Rs 2500/-, If the tax payee provides Form 10E, then Relief u/s 89(1) also provided to the Employee. If the employee filling his return after the due date, you are bound to pay the tax amount along with interest. In this Segment, if the employee unable to fill the return within the prescribed time limit the IT department will levy 1% interest per month. Paying of Advance Tax through Self assessment in the time period is mandatory, if the employee unable to fill the advance Tax on time, or the Advance Tax paid on time but less then 90 % of the actual Tax applicable, will be levy 1 % interest per month. Income Tax Departement provides installment option to the Tax Payee if the Taxpayer will pay installment underestimated calculation or not paid, the interest u/s 234 C will be invited. Finally, you get the amount of Tax along with interest if applicable. 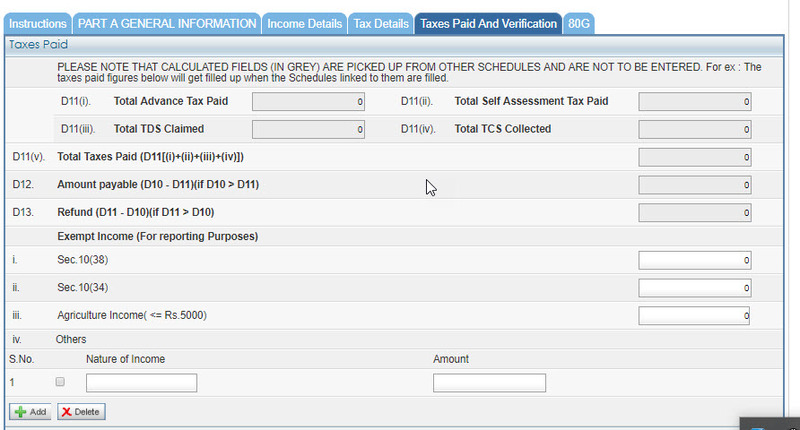 Schedule TDS 1, will automatically fetch the details from Form 16 issued by the employee. this reveals the amount of Tax deducted by the employee and paid to Income Tax Departement under your PAN number. In Schedule TDS 2, this is also fetched by the details from Form 16A issued by the deductor, for instance, “In my case from Bank. I received interest on Fixed Deposit, Bank deducted the TDS amount and paid to Income Tax Departement under your PAN number”. Schedule TCS, reveals the details of Tax collected from other party need to be disclosed. The last Section in Tax Details is very important, it required correct information for tax online i.e. BSR Code, Date of Deposit, Serial Number of Challan and Amount of Tax paid. You have to provide this information before you fill your return otherwise you must get the Notice from the department. Log in to https://onlineservices.tin.egov-nsdl.com/etaxnew/PopServlet?rKey=-1628862587 for paying advance tax, and the challan details will be punched in the Schedule IT – Details of Advance Tax and Self Assessment Tax Payable. In this section, you will get the summarised details for verification, you can check and correct the amount and details if required. You are also required to enter the income which is exempted from Income Tax Departement u/s 10(38) and u/s 10(34). In the bottom of the segment, it is mandatory for the tax payable to provide all the bank account details holding individually or Jointly with the tax department. This account number is also required for refund of money if application. If you look at the above picture name & fathers name by default already there. That means you have to declare whether you are filling for yourself or as a representative of somebody else. Enter Place and forget about the date, it is by default already there. 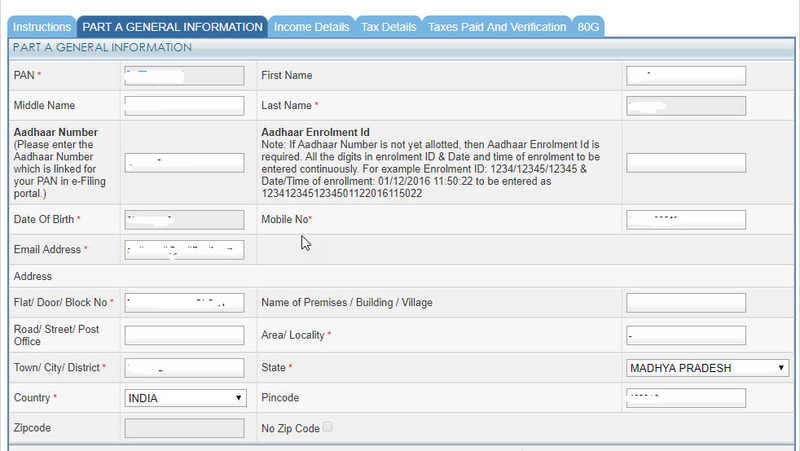 Finally, you can click on Preview and Submit the return though EVC Verification of Adhar Card, your return will automatically submit and you will get the assessment order from the IT department very soon. I am looking to take tax benefit on 80G, I have supportive receipt and PAN number from Donee. However I am not aware when to where it need to submit. I am not able to see any upload section to submit the receipt. Also I need to know how can I will take 100% tax benefit on the same. Is Form 58 essential? If essential then where is the tab to upload the same, please let me know. Hope all this work will during online ITR-1 filling it self. someone said me , we can fill details now and document submission will required if seen mail from IT Tax Dept. Please help me by your valuable guidance on this. Hello Rushikesh, Yes Form 58A is very essential which you must collect from your Donee. You can claim tax benefit under 80G while filing income tax return. You will get the separate section of 80G in the form, you will insert the PAN number, name and address of the donee along with donation amount. It is very important to know whether your donation comes under which category. We don’t have to upload any document with the form or through the mail. You must keep the documents in the office copy for ITR record. You can also refer to this https://financialcontrol.in/tax-deduction-under-section-80g/ article for more information.